The trust fund ratio for a year is the proportion of the year’s projected cost that could be paid with funds available at the beginning of the year. Critical factors considered by the Trustees in assessing actuarial status include: (1) the level and year of maximum trust fund ratio, (2) the year of depletion of the fund reserves and the percent of scheduled benefits that is still payable after reserves are depleted, and (3) the stability of the trust fund ratio at the end of the long-range period. Solvency at any point in time requires that sufficient financial resources are available to pay all scheduled benefits at that time. Solvency is generally indicated by a positive trust fund ratio. “Sustainable solvency” for the financing of the program under a specified set of assumptions has been achieved when the projected trust fund ratio is positive throughout the 75‑year projection period and is either stable or rising at the end of the period. Summarized measures for any period indicate whether projected income is sufficient, on average, for the whole period. Summarized measures can only indicate the solvency status of a fund for the end of the period. The Trustees summarize the total income and cost over valuation periods that extend through 75 years and over the infinite horizon.1 This section presents two summarized measures: the actuarial balance and the open group unfunded obligation. The actuarial balance indicates the size of any surplus or shortfall as a percentage of the taxable payroll over the period. The open group unfunded obligation indicates the size of any shortfall in present-value dollars. This section also includes additional information that the Trustees use to assess the financial status of the Social Security program, including: (1) a comparison of the number of beneficiaries to the number of covered workers, (2) the test of long-range close actuarial balance, and (3) the reasons for the change in the actuarial balance from the last report. The concepts of income rate and cost rate, expressed as percentages of taxable payroll, are important in the consideration of the long-range actuarial status of the trust funds. The annual income rate is the ratio of all non-interest income to the OASDI taxable payroll for the year. Non-interest income includes payroll taxes, taxes on scheduled benefits, and any General Fund transfers or reimbursements. The OASDI taxable payroll consists of the total earnings subject to OASDI taxes with some relatively small adjustments.2 The annual cost rate is the ratio of the cost of the program to the taxable payroll for the year. The cost includes scheduled benefits, administrative expenses, net interchange with the Railroad Retirement program, and payments for vocational rehabilitation services for disabled beneficiaries. For any year, the income rate minus the cost rate is the “balance” for the year. Table IV.B1 presents a comparison of the estimated annual income rates and cost rates by trust fund and alternative. Table IV.B2 shows the separate components of the annual income rates. Under the intermediate assumptions, the Trustees project that the OASI income rate will increase from 10.61 percent of payroll for 2017 to 11.09 percent of payroll for 2019. The projected OASI income rate is low for 2017 and 2018 because of the payroll tax rate reallocation of 0.57 percentage point from OASI to DI for 2016 through 2018, as enacted in the Bipartisan Budget Act of 2015. After returning to the pre-reallocation level for 2019, the income rate will rise at a very gradual rate to 11.47 percent of taxable payroll for 2091. Income from taxation of benefits causes this increase for two main reasons: (1) total benefits are rising faster than payroll; and (2) the benefit-taxation threshold amounts are fixed (not indexed), and therefore an increasing share of total benefits will be subject to tax as incomes and benefits rise. From 2017 to 2035, the cost rate rises rapidly because the retirement of the baby-boom generation will increase the number of beneficiaries much faster than the number of workers increases, as subsequent lower-birth-rate generations replace the baby-boom generation at working ages. From 2038 to 2052, the cost rate declines because the aging baby-boom generation is gradually replaced at retirement ages by the historically low-birth-rate generation born between 1966 and 1989. After 2052, the projected OASI cost rate generally rises slowly, reaching 15.57 percent of taxable payroll for 2091, primarily because of projected reductions in death rates at higher ages. Projections of income rates under the low-cost and high-cost sets of assumptions are similar to those projected for the intermediate assumptions, because income rates are largely a reflection of the payroll tax rates specified in the law, with the gradual change from taxation of benefits noted above. In contrast, OASI cost rates for the low-cost and high-cost assumptions are significantly different from those projected for the intermediate assumptions. For the low-cost assumptions, the OASI cost rate decreases through 2018, and then rises until it peaks in 2035 at 12.75 percent of payroll. The cost rate then declines to 11.55 percent for 2055, rises to 11.67 percent for 2070, and declines again to 11.21 percent for 2085 before rising to 11.38 percent for 2091, at which point the income rate reaches 11.23 percent. For the high-cost assumptions, the OASI cost rate generally rises throughout the 75-year period. It rises relatively rapidly through about 2039 because of the aging of the baby-boom generation. Thereafter, the cost rate continues to generally rise and reaches 21.94 percent of payroll for 2091, at which point the income rate reaches 11.84 percent. The pattern of the projected OASI annual balance is important in the analysis of the financial condition of the program. Under the intermediate assumptions, the annual balance is negative throughout the projection period. This annual deficit is temporarily higher for years 2016 through 2018 because of the 0.57‑percentage-point payroll tax rate reallocation from OASI to DI. After returning to the pre-reallocation level for 2019, the annual deficit then rises relatively rapidly from 0.59 percent for 2019 to 3.60 percent for 2037. It then declines to 3.02 percent of payroll for 2052, and generally rises thereafter, reaching 4.10 percent of taxable payroll for 2091. Under the low-cost assumptions, after the 2016-2018 payroll tax rate reallocation period, the annual deficit rises from 0.14 percent of payroll for 2019 to 1.47 percent of payroll for 2035. Then the annual deficit generally declines until it becomes a positive annual balance for 2084. The annual balance turns negative again for 2087, reaching a deficit of 0.16 percent of payroll for 2091. Under the high-cost assumptions, the OASI balance generally worsens throughout the projection period. Annual deficits rise to 1.69 percent for 2020, 6.53 percent for 2050, and 10.10 percent of payroll for 2091. Benefit payments scheduled to be paid on January 3 are actually paid on December 31 as required by the statutory provision for early delivery of benefit payments when the normal payment delivery date is a Saturday, Sunday, or legal public holiday. For comparability with the values for historical years and the projections in this report, all trust fund operations and asset reserves reflect the 12 months of benefits scheduled for payment each year. The annual balance is projected to be negative for a temporary period and return to positive levels before the end of the projection period. Under the intermediate assumptions, the projected DI cost rate declines from 2.08 percent for 2017 to 1.98 percent for 2020, and remains relatively stable through 2032. After 2032, the DI cost rate increases gradually to 2.16 percent for 2056. From 2056 to 2077, the DI cost rate stays relatively stable before increasing slowly to 2.23 percent of payroll for 2091. The projected DI income rate decreases from 2.42 percent of payroll for 2017 to 1.85 for 2019. Between 2016 and 2018, the income rate is higher due to the temporary payroll tax rate reallocation. Beginning in 2020, the income rate remains relatively stable, reaching 1.84 percent for 2091. The annual balance is positive for years 2016 through 2018, reflecting the reallocation. Thereafter, the annual deficit reappears, generally declines from 0.16 percent for 2019 to a low of 0.13 percent for 2030, and then generally increases to 0.38 percent for 2091. Under the low-cost assumptions, the projected DI cost rate declines from 2.02 percent of payroll for 2017 to 1.47 percent for 2039, and remains relatively stable thereafter, reaching 1.53 percent for 2091. The annual balance is positive for 2017 and 2018, negative for 2019, and positive throughout the remainder of the long-range period. Under the high-cost assumptions, the DI cost rate generally rises throughout the projection period, reaching 3.11 percent for 2091. The annual deficit is negative from 2019 through the remainder of the projection period, reaching 0.37 percent for 2019, 1.09 percent for 2050, and 1.25 percent for 2091. 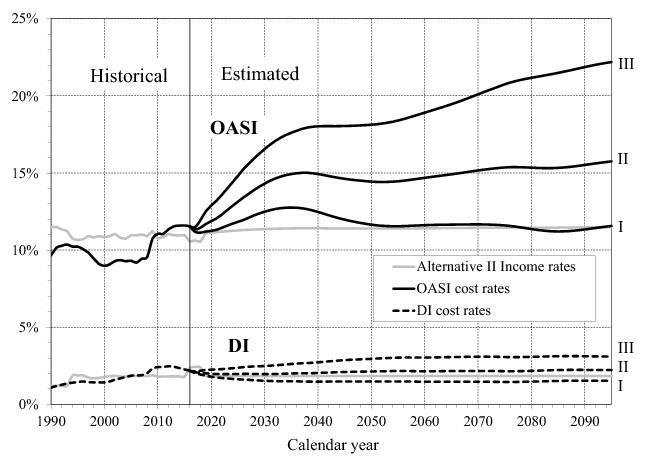 Figure IV.B1 shows the patterns of the historical and projected OASI and DI annual cost rates. Annual DI cost rates rose substantially between 1990 and 2010 in large part due to: (1) aging of the working population as the baby-boom generation moved from ages 25-44 in 1990, where disability prevalence is low, to ages 45-64 in 2010, where disability prevalence is much higher; (2) a substantial increase in the percentage of women insured for DI benefits as a result of increased and more consistent rates of employment; and (3) increased disability incidence rates for women to a level similar to those for men by 2010. After 2010, all of these factors stabilize, and therefore the DI cost rate stabilizes also. Annual OASI cost rates follow a similar pattern to that for DI, but displaced 20 to 25 years later, because the baby-boom generation enters retirement ages 20 to 25 years after entering prime disability ages. Figure IV.B1 shows only the income rates for alternative II because the variation in income rates by alternative is very small. Income rates generally increase slowly for each of the alternatives over the long-range period. Taxation of benefits, which is a relatively small portion of income, is the main source of both the increases in the income rate and the variation among the alternatives. Increases in income from taxation of benefits reflect: (1) increases in the total amount of benefits paid and (2) the increasing share of individual benefits that will be subject to taxation because benefit taxation threshold amounts are not indexed. Table IV.B1 shows the annual balances for OASI, DI, and OASDI. The pattern of the annual balances is important to the analysis of the financial condition of the Social Security program as a whole. As seen in figure IV.B1, the magnitude of each of the positive balances is the distance between the appropriate cost-rate curve and the income-rate curve above it. The magnitude of each of the deficits is the distance between the appropriate cost-rate curve and the income-rate curve below it. Annual balances follow closely the pattern of annual cost rates after 1990 because the payroll tax rate does not change for the OASDI program, with only small variations in the allocation between DI and OASI except for the 2016-2018 payroll tax rate reallocation. Long-range OASDI cost and income are most often expressed as percentages of taxable payroll. However, the Trustees also present cost and income as shares of gross domestic product (GDP), the value of goods and services produced during the year in the United States. Under alternative II, the Trustees project OASDI cost to increase from about 4.9 percent of GDP for 2017 to a peak of about 6.1 percent for 2037. After 2037, OASDI cost as a percentage of GDP declines to a low of about 5.9 percent for 2052 and thereafter generally increases slowly, reaching about 6.1 percent by 2091. Appendix G presents full estimates of income and cost relative to GDP. Table IV.B2 contains historical and projected annual income rates and their components by trust fund and alternative. The annual income rates consist of the scheduled payroll tax rates, the rates of income from taxation of benefits, and the rates of income from General Fund reimbursements. Projected income from taxation of benefits increases over time for reasons discussed on page 52. Historical General Fund reimbursements include temporary reductions in revenue due to reduced payroll tax rates and certain other miscellaneous items.